an expression occurring frequently in the Psalms, thought to be a liturgical or musical direction, probably a direction by the leader to raise the voice or perhaps an indication of a pause. His Word has a bunch of collective testimonies of past peoples before our time who has a story to tell that God heals, delivers, saves, reveals and gives hope. (Rd- Revelation 12:11) They too were given prophetic words over their life, or situation and for some did not see it come to pass until years later. The ingredient they had in words spoken to them through the prophets was believe. As it says in scripture believe in the Lord's prophets and you will prosper (RD- 2 Chronicles 20:20) . "Believe" is spoken 289 times in the Word. And As we take our Selah moment in His word, God is reminded us still today of His promises to us. If you have not received a prophetic word, then Read His word and grab promises from His word and remind him of those promises. Read His WORD and GRAB His Promises from it regardless if you received a prophetic word or not. ( Rd- 1 Timothy 4:5) Pray through the word of God. And He will set to perform it. Shortly after I longed for another child in which the vision was given. In hopes of my girl I saw. I thought surely soon this would happen, but it just wasn't God's time line. And I ached for her to come into my life as that vision was a seed planted. I would write it down as it says in - ( Read- Habakkuk 2:2-3) and Pray her in. The Lord was faithful over the next 8 years in sending different people from different places we lived at due to prior military moves and God would encourage me that my girl is coming. She ( Grace) came on time in Sept. 2010. And I was then blessed with another Girl in 2013. I took several Selah moments in His word over my heart's desire's and prayed it in, and I got a double portion of blessing because of it. So I encourage you today to pause and reflect on His word, and those promises of prophetic words spoken to you as it will surely come to pass. Don't let it go but trust that God is NOT dead and He is still alive and he WILL set to perform His word. How do we know what he has promised unless we take time to spend it reading in His word. If you're like I was in some seasons of hard to read and get much into the WORD, ,I was able to press in through reading it out loud, and by listening to it in audio as the Word says: Faith comes by hearing and hearing by the WORD of GOD. Your Spirit will begin to get nourished once again and you'll then developed a good habit of Getting into His Word. As that seed will grow into a strong tree planted by living waters in your soul. May You have your Selah Moments and be encouraged today.
" Selah" The Hebrew above the word Selah is written in Hebrew for the same word 'Selah" And the art piece represents one who pauses and reflects on God's word and His Promises. The Tree is planted by living waters, It's Decorated in Treasures like the Pearls as in Scripture of the Pearl about heaven, the Heart shaped watch as meaning spending time with him day and night as my heart is set on him. And the Star of David is meaning His Symbol of history and that He (Jesus is still Jewish) And my heart has been and still remains for the Jews. 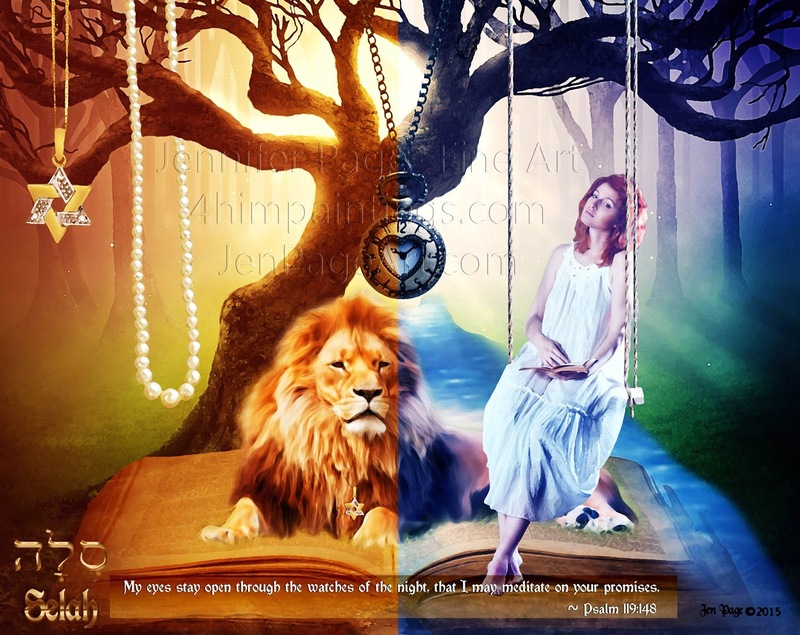 And then there is the word of God that the lion of Judah is resting on as is the Bride in the night reading in her hand. 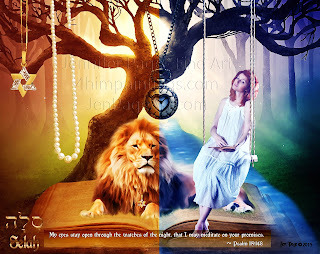 Jesus is the Lion of Judah and His presence is with her. The Bride looks with her eyes opened and heart rested as she reflects on His Word, On His Promises. And the Image shows both day light and Night as to show His Presence is with her day and Night. broken hearted. We also encourage young and the adults from the west to come to Mumbai to work with us during their vacation time. Since your desire is to use your art for the glory of the Lord, we would love to have you come with your friends to Mumbai to work with us and capture the life in the slum in your art to make those art pieces available for people to buy by doing so you will be a great source for the kindgom of God as well as for you.for you. My email id is: dhwankhede(at)gmail(dot)com and my name is Diwakar Wankhede. Looking forward to hear from you very soon. God's richest blessings on you. We have in our church an artist who paints different kinds of birds on the card. He makes hundreds of such cards which we make them in to Greetings card for people to buy them. Each card is hand painted by him. God willing I am coming to the states in the third week of this month and will be so glad to meet you with the cards he has made. I sale these cards when I come to the States and what ever proceed comes is used for the ministry in the slum. Please let me know so that I can plan my itinerary accourdingly. Let me know the place and the State of your residence.